Water is a powerful and destructive force which can damage your home and belongings in many ways. Not only can it take a toll on your possessions, but also pose a threat to your health. In these cases, it’s imperative to act quickly and seek water damage remediation immediately. This is especially true for any type of flood, so every second wasted adds a higher cost to flood damage restoration in San Diego. When thinking about restoring your home after a flood, you should call professionals who know all about the types of water damage and reducing water damage effects. Remember, no damage has to be catastrophic if you deal with it swiftly and properly. The short answer is, yes, a flooded home can definitely be saved, but this does depend on several factors. The first and foremost is removing the last bit of moisture quickly, before the damage is irreparable. Industrial level equipment is needed for this, the kind only professionals have, because it can help in preserving even the electronic appliances. What most people don’t know is that, although water itself is very dangerous, the real problem behind flooding is the possible mold infestation. It gets worse with time, especially when it spreads throughout the household, infecting anything it comes in contact with. With a timely intervention, all walls and floors can be saved from it and water damage doesn’t need to ruin your home in San Diego beyond help. 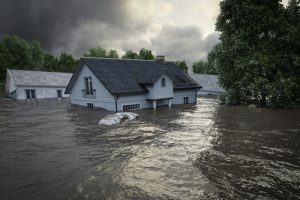 What you need to keep in mind at all times is that flood damage remediation can be very expensive and at a certain point it might not be worth it. However, this doesn’t mean you shouldn’t preserve your home, if that’s what’s most important to you. The whole process is fairly easier with homeowner insurance, just make sure to check what is it exactly that your policy covers and whether it includes flood insurance. How do I dry out my house after a flood in San Diego? Mitigating water damage and saving your possessions after flooding is effective when you act during the first 48 hours. Depending on the type of floodwater you come across, it might be better to call professionals, but if you do decide to tackle the task yourself, remember to stay safe by turning off power in flooded spaces. Also, take pictures of everything for insurance purposes before applying the following steps. The air needs to be moved and you can do this by opening windows when the weather is dry during the day and closing them at night. If it’s safe to use electricity, use any type of fans, blowers or window air conditioners, but don’t use the central HVAC system because you can spread contaminants. What you should also do is open any cabinet doors and drawers to increase the overall air flow and dry the furniture easier. With a good air flow, it’s time to deal with the moisture, first by using a dehumidifier to remove all vapor from the air. Large soaked items like rugs and furniture should be placed outside in the sun and any soft items affected by water should be thrown out. Some flooring can be moved to allow what’s underneath to completely dry, while soaked insulation also might need to be removed and disposed of. All surfaces and areas which were soaked need to be completely cleaned after they dry out, so mold and mildew doesn’t appear on them. This can be a serious health issue if their pores spread, so a proper disinfectant is necessary. Again, you can do this yourself, but it’s better left to the pros. 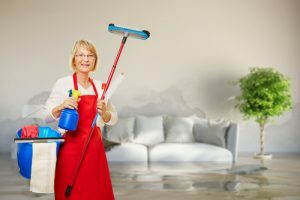 How do you clean flood damaged items? When it’s time to clean soaked items and prevent mold from appearing in your San Diego home, taking necessary precautions is a must. This means wearing protective clothing and determining which items are worth your time and which should be thrown out. If you feel your time is better utilized by going to Petco Park for a game of baseball, call professional flood damage remediation companies instead. Carpet cleaning is best handled by experts, if it’s removable carpets. Installed ones, attached to the padding underneath, can’t be properly cleaned and should be disposed of. When only a part of the carpet has been soaked, use a wet-dry vacuum, then clean it thoroughly and spray with disinfectant when it has dried out. Furniture with solid surfaces should be easy to clean, it just needs to be taken outdoors, where all doors and drawers can be removed. Then clean it with a mild mixture of water and soap or detergent and leave it to dry out of sunlight. Upholstered furniture can only be saved by qualified professionals, while soaked mattresses will probably have to be thrown out. If appliances have been affected by water but not completely soaked, they might be salvageable, but they need the hand of a service person. They will know to check all the cables and see whether the appliances are safe to turn back on after a period of drying. First step for anything washable is to be rinsed in cold water with a detergent. The next thing to do is machine wash the clothing, using the highest safe temperature for the garments and with both a detergent and a disinfectant. Afterwards, the items should be dried for as long as it takes. When you are looking for flood damage restoration experts in San Diego, you need to look no further than KIC Restoration. We specialize in all types of flood damage remediation and are well equipped to tackle any of them. This includes the whole restoration process, mold prevention and remediation, as well as water damage repair. Fast response is essential when it comes to flood damage, so we are there for you 24/7. When you contact our call center, you will receive a detailed estimate of steps to take and probable costs, with no hidden fees. The same people who took the call, skilled tradesmen, will probably be the ones responding to the emergency. Our comprehensive process is something you can trust, as witnessed by our five star ratings, and we use only cutting edge equipment. Call us for any inquiries at your behest.